We can help you open your very own Home Care Business. We are the industry experts and have assisted over 3000 people open new Home Care Agencies, Hospice Agencies and Non-Emergency Transportation companies. Opportunities to start a home health care business are more abundant than ever before. This is mainly due to the increase in elderly population as well as the baby boomer generation. Most retired Americans prefer to be cared for in the comfort of their own homes. Our home health care consultants can help you become certified to open a home health care agency or start a home health care business. In a USA Today news article, journalist Kelly Kennedy reported on the top 5 most profitable businesses in the United States. Accordingly, the home health care business made the list. The article also cited home health care business owner satisfaction and nearly immediate returns on investments. Thanks to high demand, low overhead, and respectable ROI, home health care, especially for seniors, is growing exponentially.The home health care business industry is typically averaging 25% to 35% net profit. In order to meet the ever-increasing demand for home health care agencies, more quality home health care training will need to be implemented. Because of this demand, we crafted an industry-leading home health care training program. At 21st Century Health Care Consultants, we take the hassle out of your home health care startup business endeavor. We make the home health care startup process fun, rewarding, and profitable. We have a win-win solution for you! Our home health care startup program will help you start a home health care business or open a home health care agency without franchise or royalty fees. With over 20 years’ experience, we provide the most comprehensive home health care training program in the industry. Our home health care agency consultants will ensure your home health care startup becomes a lucrative investment while making a difference in patient’s lives. Open your own Home Care agency the right way. All of the following benefits and services are included in our new agency startup program. At 21st Century Health Care Consultants, we handle every aspect of obtaining a home health care license for you. First, we complete your states’ home health care license application plus all additional required home health care license paperwork. Second, our home health care consultants proceed with incorporating your home health care business. And third, we secure a Tax ID and NPI number. Every state has different home health care license and operation requirements. For this reason, our home health care consultants are well-informed in every state. We not only assure that you will get your home health care license, but we also eliminate the headache of doing it yourself. As a result, the process for you to start a home health care business or open a home health care agency becomes less overwhelming and more productive. 21st Century’s home health care startup process includes all required home health care policy and procedure manuals. These manuals are written to meet state standards and are customized to your home health care business, including the logo, staff, and office details. Additionally, the home health care startup process includes all operation forms and documents needed to start a home health care business. This ensures compliancy with State and Federal regulations. As part of your home health care training, we teach your staff how to eliminate accreditation deficiencies in order to pass accreditation site survey inspections. Our core home health care consultants are former CHAP Accrediting Body Senior Site Supervisors. We perform an on-site mock home health care accreditation audit. The on-site audit consists of a complete review of your agency’s operations. Accordingly, our mock auditing procedures are similar to those of the accreditation site surveyor. This enables you to be prepared for a private duty certification. When it comes to patient care and documentation – rest assured, you will have peace of mind. Your business is backed by the clinical expertise of 8 degreed, registered nurses. In fact, several of our skilled nurses are former state auditors and CHAP surveyors! Best part is they’re available when you need them. With this level of support, you can build confidence and influence trust in your business. At your convenience, our certified senior home health care consultants provide ongoing support via phone or email. Our home health care consultants are dedicated to supporting you with overcoming the challenges and obstacles you may encounter when operating a successful home health care agency. With this in mind, operating a successful home health care business depends on having all the building blocks in place. Our home health care consultants are committed to helping you establish your business while increasing recognition in your market area. Our coaches will assist you with understanding the requirements around providing services in relation to the activities of daily living. 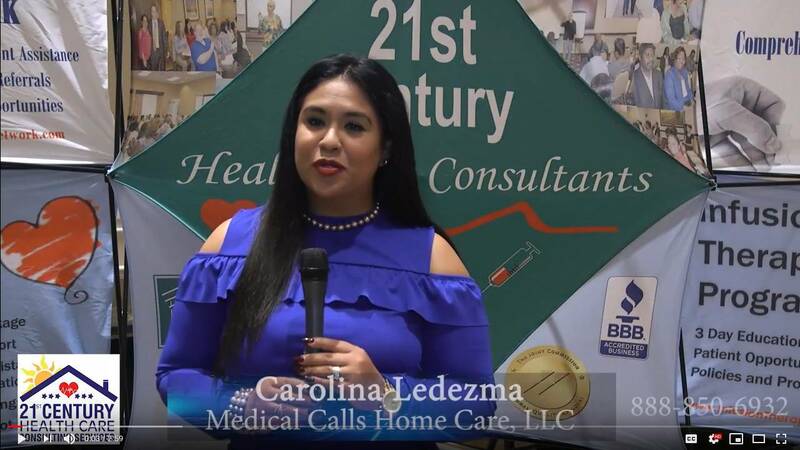 When you’re in need of home health care agency consulting, 21st Century Health Care Consultants has you covered! With our lifetime home health care training and support program, our home health care consultants are available to assist you at no additional cost. Whether it’s admitting patients, obtaining new clients, marketing techniques, or even how to handle medical emergencies, we offer home health care training seminars on any topic you need. Our home health care training seminars are 4 days in length and held quarterly. They’re available at no extra cost to you or your current and future employees. This is an amazing perk when you operate a home health care startup or open a home health care agency with us. Another key point of our home health care startup development is to organize your human resource department. Our home health care consultants’ set-up your personnel files, competency evaluations, job descriptions, performance evaluations, plus any other necessary forms. Marketing can be an area that’s overlooked when planning to operate a home health care startup. However, effective marketing is essential when growing your business and spreading the word. 21st Century provides a fully customized website, complete with search engine optimization (SEO), tailored specifically for your home health care business. The goal of your SEO website is to have your business achieve first page presence on search engines like Google, Yahoo, and Bing. It’s no secret that a strong internet presence is vital for a successful business, and we give you the tools you need to succeed online. In addition, we design and provide you with customized business cards and brochures to satisfy your offline marketing desires. All marketing files and materials belong to you and your business. Family Portal Access (your patient’s family can login and view how their loved one is being cared for). When it comes to specialty programs, our home health care consultants provide the necessary materials and training to implement each program. We work one-on-one to successfully develop and execute these specialty programs. 21st Century Health Care Consultants is proud to announce partnership with AON / Affinity. This collaboration will provide discounts on home health care services. It will be offered to over 25 million AON / Affinity clients enrolled in their health care insurance programs. Patient opportunities for home health care services will be provided by clients of 21st Century Health Care Consultants. To further your expertise, we host monthly webinars to support you on your home health care business journey. Our informational webinars give you the guidance you need to open a home health care agency. Did you know 90% or more of hospitalized patients are receiving some form of infusion therapy? Because of this statistic, it’s an exciting time to enter the home health infusion therapy arena. Give your home health care agency a competitive edge by providing infusion therapy as a specialty program. The average reimbursement for 1 infusion therapy patient referred to you by an infusion pharmacy is around $1,625.00 for 13 visits. That’s equivalent to $125.00 per visit! We train you on how to provide and market these services not only to infusion pharmacies but also to worker’s compensation and commercial insurances. As our valued client, we provide patient referrals exclusively for you and your business. Further, we offer a home health care resource guide for patients in need of home health care services throughout the country. In addition to our network of resources, we have a featured business directory. Once your agency completes our standards of excellence program, it becomes eligible to appear in the directory. The home health care businesses featured in this directory are as a result of attending our comprehensive home health care training programs. In honor of our nation’s veterans, 21st Century is proud to offer several veteran home health care patient resource and support programs. When you start a home health care business or open a home health care agency, you have access to this incredible resource. This is a wonderful opportunity to offer home care to veterans and their surviving spouses. Approximately 1 out of every 3 seniors across the nation will qualify for the programs. Did you know there are government programs that pay for home health care? Medicaid Waiver Network is an expert organization well-informed in completing all required forms. This will assure approval and acceptance into state and federal programs. At 21st Century Health Care Consultants, our goal is to establish and maintain a well-balanced stream of revenue from all resources (whether public or private). Call us for a no obligation consultation? Why settle for a “membership company” or small consultant group when you can work with the largest network of home health care consultants in the industry? We’ve worked with home health care business startups in every state and guarantee our home health care startup process. Our home health care consultants provide ongoing consulting to you and your staff. We’re always available to answer questions or address any concerns you may have. Established in 1995, 21st Century Health Care Consultants has been in business for more than 24 years! We have assisted well over 3,000 home health care business startups. We’re proud to employ a team of more than 40 full-time employees, all with specific fields of expertise. Most home care franchise companies and home health care consultant businesses can’t compare to those stats. We have 8 Masters Prepared Registered Nurses on staff. 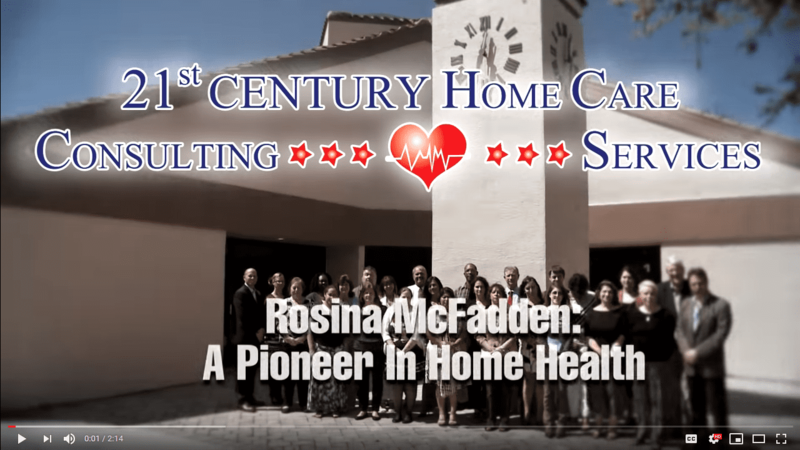 Among these Registered Nurses is our CEO, Rosina McFadden. Rosina is a former Senior CHAP Accreditation Site Surveyor of 15 years. She pioneered New York’s Long Term Home Health Care Program, which has become the model for home care as we know it today. 21st Century Health Care Consultants is the premier home health care consulting company. You won’t find another business in the industry with as many clients, references, or full-time employees as 21st Century Health Care Consultants. Let us help you start a home health care business or open a home health care agency. Although our stats and numbers are quite impressive, we encourage you to explore the results for yourself. Hear it straight from our satisfied client testimonials. Ready to Become Part of Our Network of Satisfied Clients? Peace of mind that you chose the right consulting company. Peace of mind in knowing you partnered with a consulting company that has been in business since 1995. Peace of mind of working with a company that has established well over 2,000 agencies throughout the United States.